I want to share with you a Life-changing practice that I learned at Yoga Teacher Training that years later, I still practice everyday. Mindful Eating – We grew up learning “don’t play with your food” and “don’t chew with your mouth open” and “don’t talk with food in your mouth.” These childhood rules fall under etiquette, and so rule questioners like myself maybe stopped believing in what someone told me about how to eat. It’s instinct isn’t it? Well, things like trauma, anxiety, and being overly busy all change our instinctually healthy eating patterns. So in my 200 Hour Teacher Training, we were taught how to eat. I found my digestion improved and so did the enjoyment of my food. Food went from fuel status, just eating to stay alive, to slowing down enough to taste and savor each bite of nourishment. -Chew until there are no more chunks. -Only swallow after every bit has been chewed thoroughly. -Don’t talk with your mouth full or eat silently. -Take two handfuls of food at a time. -After finishing the food on your plate, and you’re considering taking a second helping, wait 5 minutes. And since learning and incorporating these into my “diet,” my partner Murray and I have added a couple more. -Take a minute or two before and after the meal to just relax. This allows the body to transition to parasympathetic nervous system, which is responsible for digestion. -Eat with gratitude. Each bite is precious and it is nourishment from the Earth for You. What a gift. And here are two tips from Michael Pollan, my favorite food author that wrote Omnivore’s Dilemna and The Botany of Desire, both of which I highly recommend reading. -Eat enough, but not too much, and mostly plants. -Eat as much junk food as you like, but cook it yourself. There is something magical to cooking the food yourself, Pollan explains, and that is those that cook their own food tend to have a healthier weight. If you want to learn this and more life changing practices, consider a yoga teacher training. Here’s a breakfast we had while traveling in Costa Rica, obviously not following the two handfuls rule, so we took a to-go box. 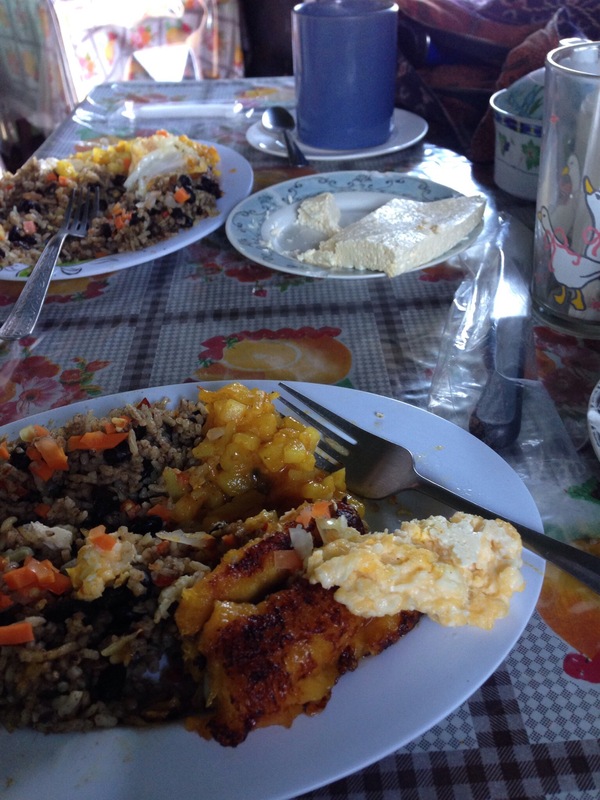 This entry was posted in yoga and tagged 200 hour yoga teacher training, costa rica, etiquette, food, michael pollan, mindful eating, yoga, yoga teacher training, ytt. Bookmark the permalink.